The truss frame is entirely built with mono directional high module carbon fiber tubes. The connection rings are fabricated with 6 mm high module carbon fiber plates cut with water-jet and further reinforced with 2 mm plates in the areas of maximum stress concentration. The truss joints can optionally crafted in grade 5 CNC titanium. The primary mirror cell is a true technological jewel: 100% structural carbon fiber construction, 9 points computer optimized mechanical cushion, and zero thermal expansion. It is fully tiltable through 3 titanium bolts placed on the telescope's back plane. The cell's maximum deformations under the highest mechanical stress configuration (tube pointing at the zenith) are less than 0.03 mm. This value still improves with the optional Carbon/Titanium back plane. With the secondary mirror assembly we created a mechanism of unmatched reliability, stability and lightness. The fully tiltable cell is fixed on a 20 mm rectified titanium bar, firmly held in position by a high precision axial linear ball bearing. The focus of the secondary mirror is easily adjustable through the titanium bolt placed on top of the mechanism. The dovetails are engineered with a proprietary hybrid Aluminium-Carbon fiber construction (optional Titanium/Carbon). This type of design minimizes torsion deformation and structural misalignment under every pointing orientation. In comparison with traditional CNC aluminium dovetails, the deformations are reduced by a factor 40. 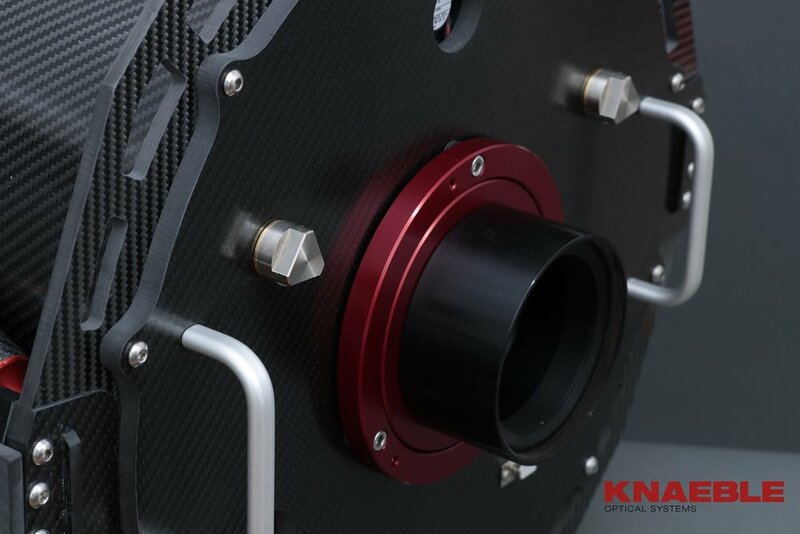 The back plane on all standard models is made of a solid 10 mm thick, high module carbon fiber plate. It can host up to a 3.5" focuser with ca. 10 kg of equipment attached. The second dovetail can easily carry ca. 6 kg of additional equipment (e.g. a refractor, various tracking devices, etc.) without provoking substantial deformations on the main structure. The optional Titanium/Carbon design (see photos) ensures an even higher strength. Ritchey-Chrétien f7.5 Zero expansion optical set (Sitall, Pyrex or Zerodur). Made in Italy by Marcon Italy. M1 360 mm f3.5; diameter M2 150 mm. Total mass (including dovetails): ca. 30 kg. FEM mechanical, modal and thermal simulations are performed with Ansys Workbench. Proprietary 18 points computer optimized Full-Carbon-Fiber primary mirror cell. 10 mm thick solid carbon fiber CNC backplane. Optional composite Carbon-fiber/Titanium backplane construction. Proprietary Zero expansion Full-Carbon-Fiber/Titanium truss construction. Tiltable focuser mounting ring optimized for 3.5" Starlightinstruments focuser (smaller diameters are available on request). Proprietary "Hollow Technology" hybrid CNC Aluminum/Carbon-fiber (Losmandy compatible) dovetail plates. Completely made in Germany from Italian made components.